Novelty always has been the reference point, whether we're talking about Al di Meola, the composer, or Al di Meola, the fabulous guitarist. His style and sound make him one of a kind, and although his discography exhibits swings between acoustic and electric, his searches through many other musical environments that possibly bring a sonorous asset to as work, such as accents of chamber orchestration, playing with instrumental arrangements, all charged with emption and intensely inspired. Nothing takes from the intensity and the passion of his music. Moreover, going back to the '70s electrical guitar, a period marked by the most explosive innovations in modern music producing the most amazing albums, demands an enthusiastic round of applause. 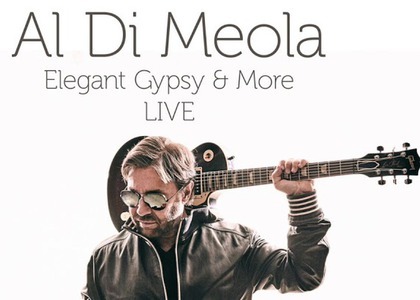 Listening to Al di Meola at the age of 63, in the most peaceful and balanced period in his personal life, is a real pleasure, like rediscovering something that you thought you would never find. Elegant Gypsy is one of those fantastic albums released more than 40 years ago, when rock and jazz complemented each other's musical history through their inspired merge that bred some memorable, incredible productions. Meolas recreated his second album in his 2017 American tour, which resulted in an vital album, noted for its way of keeping the intensity and the passion of a guitar genius, in his prime. An Album imbued with youthful creative anxiety on the one hand and gained experience on the other, and the detachment of a master that has nothing to prove, but only to celebrate.